This weekend I broke the rules and cast on the cutest little sweater. Friday night was a super busy knit night and one of our charming knitters had the pattern for the Baby Sophisticate Sweater and she was casting on. I couldn’t resist, I went home and cast on too. 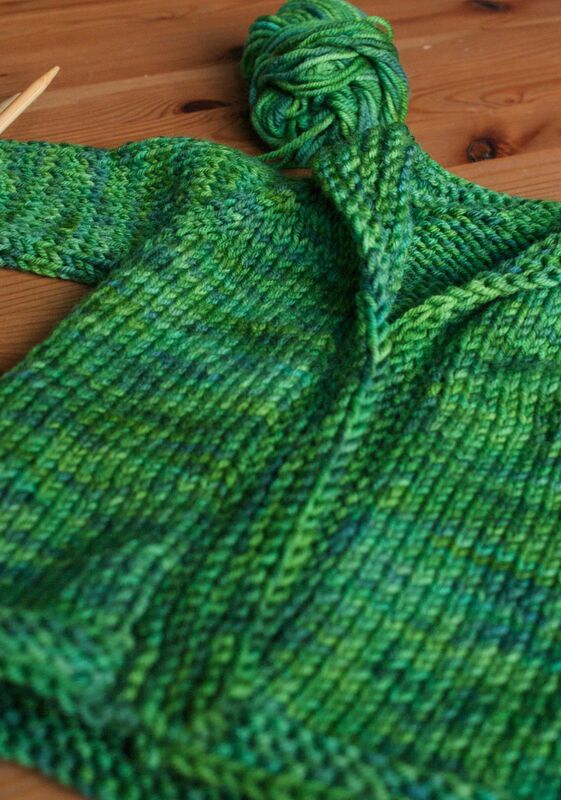 I don’t know if it was the shawl collar that got me, or perhaps the promise of using toggle buttons but I was a bad little knitter who went to her box of needles and pulled some out. I used some Dream in Colour Classy I had on hand in the colour Happy Forsest. Now, the problem came about 3 inches in when I realized it was coming out rather tiny. I know babies are small but the sweater was coming out REALLY small. So I took a gander at the pattern, recommended needle size, yarn gauge, pattern gauge. It just didn’t quite add up. 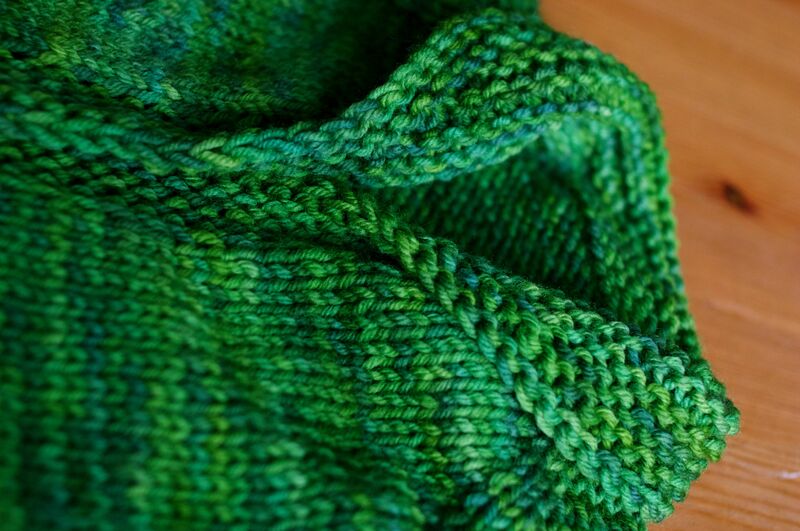 The yarn is an 18, the needles are a 5mm, that makes perfect sense. Normally i would get 18 stitches per 4 inches no problem. I measured out my gauge and I sure did have 18 stitches, the problem is that the pattern gauge is 15 stitches per 4 inches. The pattern designer must be a VERY loose knitter to get that gauge. 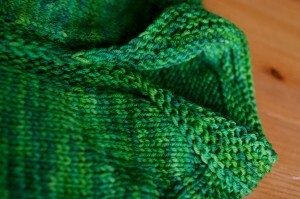 I had a couple of options, I could go up a couple of needle sizes or I can use a bulkier yarn or both. I decided that I really loved the colour of this yarn and a slightly looser fabric would be okay so I went to some 6.5 mm needles and started over. I had everything but the last sleeve done by Monday morning, what a great quick knit. Now I just need some adorable buttons…..
the pattern, which can be found here. This entry was posted on Tuesday, September 28th, 2010 at 12:07 pm	and is filed under Uncategorized. You can follow any responses to this entry through the RSS 2.0 feed. Both comments and pings are currently closed. Wow, you are so quick! I was so happy to hear your comment about the sizing because I thought I had done something really wrong! It’s teeny! I will go with 6.5mm… thanks! Thanks for the great pattern idea! I wasn’t even really working too hard to get it done in a weekend, how great is that?! What other colors does the store carry? Loving the blog posts and all the beautiful baby projects! I’ll be there, and no problem, I’ll have my Baby Sophisticate on site! I’ll be there, and I’ll have my Baby Sophisticate on site! We’ve got a pretty full range of colours in Classy, a nice little rainbow! 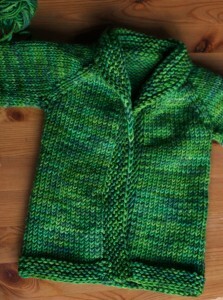 Does your new gauge knit up to a newborn size or 0-3 month-ish? Thanks!!!! I knit the larger of the two, it still knit up a touch small but pretty close.